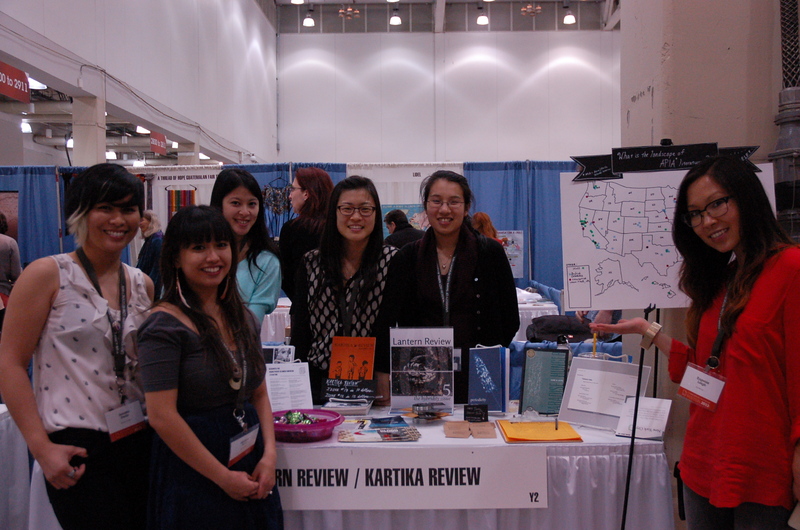 Mia and I in the AWP 2013 bookfair with our APIA lit mag colleagues. AWP 2014 is just around the corner, and although neither Mia nor I can make it this year, I thought that—for those who are going—I would share a bit of what I’ve learned from past years about how to get the most out of the weekend without letting it break me. Don’t get me wrong; I love AWP. It’s an amazing resource and a great opportunity for networking, for encountering new work, for hearing literary heroes read or speak, and for participating in critical and creative exchange with other writers. But AWP is also enormous. It’s filled with thousands of people, the schedule is packed with pages upon pages of events, and the bookfair is filled with hundreds of tables offering items for sale. I can’t claim to speak for everyone, of course, but for writers like me—who happen to be introverts, travel on a budget, and/or struggle with decision paralysis when faced with choices as simple as which variety of dish detergent to purchase—this can sometimes feel incredibly overwhelming. Fortunately, over the course of the five AWP conferences that I’ve attended, I’ve discovered that a little planning and pacing can go a long way toward making my experience healthier, more manageable, and altogether more enjoyable and fulfilling. If you’re going to AWP for the first time this year, or even if you’ve been before and want to minimize the crazy-making aspects of your experience this time, read on for some tips. 1. Pack light, but be prepared. Check the weather forecast for the host city and try to pack appropriately (the last three years, it snowed heavily during the conference, and I was extremely glad that I had brought my winter boots and thick coat with me). Be sure to pack shoes that you’ll be comfortable walking or standing in for long periods of time, and that will provide you with some measure of protection from wet or cold weather. I also suggest planning to dress in layers during the conference. Especially during colder weather, hotels and conference centers tend to keep their heat up pretty high, and the bookfair in particular can be sweltering with all of the people milling around inside, so it’s a good idea to wear a couple of layers in case you start feeling very warm indoors (overheating inside the building is just as miserable as freezing outdoors). Also, if you have business cards, bring them! And if you don’t, I suggest considering getting a few made up with your name, email address, social media handle(s), and web site if you have one: Overnight Prints offers a great bargain for a solid product; for those who want something a little prettier, I highly recommend Moo.com. Lastly, don’t forget to leave extra room in your suitcase (or to pack a second, collapsible bag that you can pop out and fill up later). You will inevitably come home with books and other treasures, and you’ll want someplace to put them. 2. Plan your schedule selectively and strategically. Before the conference, look at the schedule and decide what events are absolute must-attends for you (if possible try to limit yourself to one of these per day; you’ll inevitably add more on later, but since there are so many events, it’s helpful to begin the conference with a sense of which events you would absolutely regret missing). Once at the conference, re-evaluate every evening, and map out two to three “target” panels to attend the next day, but be flexible. If other panels happen, wonderful! If not (and even if you don’t make it to all the events you’d planned to go to), don’t kick yourself. If you find that you really need a nap instead of attending that reading, take the nap (if you fall asleep while sitting in the audience at the reading, you’ll be missing it anyway). 3. Plan meals wisely and carry snacks with you. Though it can be tempting to do so when you’re running from panel to panel, try not to skip meals if you can help it. Especially during a conference that requires a lot of energy, it’s easy to crash hard without warning if you’re not eating when your body needs it (sadly, I speak from experience). I never eat much breakfast normally, but at a conference like AWP, I’ve found that eating something in the morning is a must. If you’re short on cash and your hotel doesn’t offer complimentary breakfast, I suggest making a trip to a local grocery store the night you get in to stock up on things to eat in the mornings. (I like granola, yogurt, and fruit.) It’s also a good idea to purchase some healthy snacks that you can tuck into your bag, or even a quick packed lunch (like crackers and cheese or a deli sandwich) if you are planning on attending a panel that runs during the lunch hour, so that you can refuel during the day without having to pay conference concession prices. Where eating out is concerned: if weather permits you to explore outside of the convention center, do so! Explore the character of the host city and support its small businesses by trying out local eateries when you can. However: as with anything else, be flexible—if Subway (or even that cupcake kiosk) is the only (or best) option at the moment and your body is telling you that you really need food, eat whatever it is without guilt. 4. Hydrate. True, you may not be running marathons at AWP, but you’ll be doing a lot of walking, a lot of talking to other people, and a lot of sitting in rooms with dry, heated air. I suggest bringing your own reusable bottle to refill at water fountains or bottle-refilling stations (if they’re available). Perhaps it’s overkill, but I always carry two vessels with me: an insulated travel mug for hot tea (especially helpful for staying alert during morning sessions) and a water bottle that I refill frequently throughout the day. 5. Make it a goal to meet at least a few new people. This sounds like a no-brainer, but I find that some of the best and most fulfilling interactions I’ve had at AWP have come from simply working up the guts to talk to people I don’t know. It can be easy to wander through the conference without so much as a word to anyone new—but I think that would a bit of a shame, as one of the greatest parts of AWP is the opportunity to converse and share ideas with people outside your regular network, whether that means striking up a conversation with the people manning a random bookfair table or going up to someone after a panel and saying, “I loved that poem you read,” or “I really appreciated what you said about ______!” If you have a hard time with this, like I sometimes do, try to set yourself small, attainable goals: I will introduce myself to one panelist today, or I will strike up a conversation with at least one person in the bookfair this afternoon. 6. Consider teaming up with a friend. Sometimes all of the going up to strangers and finding a place to grab lunch that isn’t already crawling with other attendees can be easier (and more fun, even!) when you’re doing it with a friend. Having attended the conference together several times, Mia and I have found that we appreciate having one another to compare notes with at the end of the day. It helps us process what we’ve seen and heard and done, and it’s nice to get to share the most exciting moments with someone, as well as to have someone to laugh with or to sympathize with you over mishaps. You don’t have to do everything together if you buddy up with someone, but it’s nice to have a friendly face on your side. 7. Carve out little moments in which to get away, reflect, and recharge. In the midst of a whirlwind of events, it can be very helpful to take a little time off. Whether you intentionally retreat to a quiet corner to write a little in your notebook, steal an hour for a quick off-site trip with a friend, retreat to the hotel for a nap, or even just sit on the sidelines with a sandwich and people-watch, it’s nice to plan in opportunities to step back and be a non-participant for a little bit. I’m very type A and have a bad habit of pushing myself to keep going, going, going until I drop, but I’m also an introvert, so I find that taking the time to get away from the fray not only enables me to take stock and process the experiences and conversations of the last few hours, but it also helps me to feel much more refreshed when I charge back in again. I still distinctly remember how life-giving it felt to just sit in a window of the convention center and write for a bit one afternoon when the conference was in Denver a few years back, or how much fun Mia and I had sneaking away for ramen during the following year’s conference in DC. Why wait until the end of the conference, when you’re exhausted, to step back and process all that you experience there? Better to begin thinking about things while they’re still fresh. 8. Pace yourself in the bookfair. It may be gargantuan, stuffy, and loud, but the bookfair can also be absolutely wonderful if one explores it strategically. I love running into old friends, discovering a fascinating collection or a gorgeous broadside after a chance encounter at a table, picking up books that have been on my to-read list for months, or finally meeting an editor with whom I’ve previously only worked online. In recent years, I’ve spent many hours in the bookfair while tabling for LR, but even though I’ve gotten more used to the hubbub of the exhibit halls by now, I still find that I can start to feel overwhelmed if I try to take in too much of the floor at once. I recommend pacing yourself by exploring the fair in several small, bite-sized doses. Do a few short pass-throughs at different points throughout the day, rather than trying to see everything in one marathon session. Figure out where the booths or tables that you definitely want to visit are located and hit those first, then use the rest of your time just to wander, browse, and chat. Consider pacing your spending in the bookfair, too. I find that if I don’t wait until I’ve been through most of the fair at least once before I start committing to purchases, I all too easily go over budget! It’s also sometimes a good idea to wait until the last day to do the bulk of your buying, since historically, vendors have tended to give deep discounts on the Saturday. 9. Seek out things that are life-giving. Dig deep into community. Sure, AWP is partly about professional networking, but for me, it’s also about re-grounding my identity as a writer. I think this is especially important to remember for writers of color who may live in geographically far-flung places where there aren’t a lot of resources for them nearby. As an APIA poet who currently lives in Kentucky, AWP is one of the few opportunities I get to engage with and hear from other APIA poets in person. So while I’m interested, at some level, in networking, I’ve come, especially since finishing my MFA, to really appreciate the opportunities that the conference offers to dig into community—to strategize and problem-solve together, to collaborate, to have fun together, and to listen to and receive each others’ work. This, in fact, may be the most important aspect of AWP for me. So I encourage you to prioritize the things that will nourish you personally (not just those that will advance your career). Seek out events and gatherings that speak to you and that will remind you of who you are. Go to readings by writers whose work inspires your own (not just to readings by headliners). Go up to the readers and tell them how much their work means to you. Ask questions after panels. Get together with other writers of color to chat. Let your discussions spill into the dinner hour and into the night. I’d also encourage you to seek out community resources in the bookfair. For APIA poets, the Kundiman and Kaya Press tables are both excellent places to start. Talk to the people behind the tables. Introduce yourself; ask them questions. There are few other circumstances that bring together so many different members of a given writing community in one place, so savor the opportunity to dig deep. Are you going to AWP this year? If so, what are you most looking forward to? If you’ve been in the past, what tips for getting the most out of the experience have you found to be most helpful ? Let us know in the comments or on Facebook or Twitter. We’d love to hear any wisdom you have to share. I’m going to AWP this year and I appreciate you writing this, especially about taking breaks and bringing a water bottle! Hi, Clara! Thanks for reading. I’m so glad you found this helpful. Safe travels to Seattle. I hope you have a wonderful time at AWP!